Dan is one of those rare people who always knew exactly what he wanted to do: become a master goldsmith. As a young boy, he had a penchant for skipping school so that he could flatten pennies on the railroad tracks of Wyoming. At the age of 8, he stole his father’s propane torch and melted the lead fishing weights in the basement, pouring the lead into his Mattel skull mold and proudly showing the result to all of his grade-school friends. 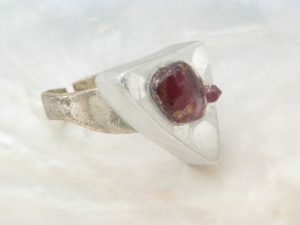 Dan made his first ring, of sterling silver and garnets, at age 13 after a rock-hounding trip with his mother. Dan’s attendance was better in high school, where he could take welding for credit — and he became the state welding champion. When he finished high school, he hopped on a bus to Portland, where he knew he could find an apprenticeship with a jeweler, and he never looked back. Now a master goldsmith and gemsetter, Dan has been working with metals and gems for over 30 years and has worked on almost every aspect of jewelry possible. He has made everything from ½ inch copper bees to a double life-sized bronze sculpture. He is an expert in the arts of forging, gem setting, wax carving and lost wax casting. He also is an accomplished die maker, having made coining dies and other jewelry stamping dies; and additionally, he has made bronze molds for a local glassblower. 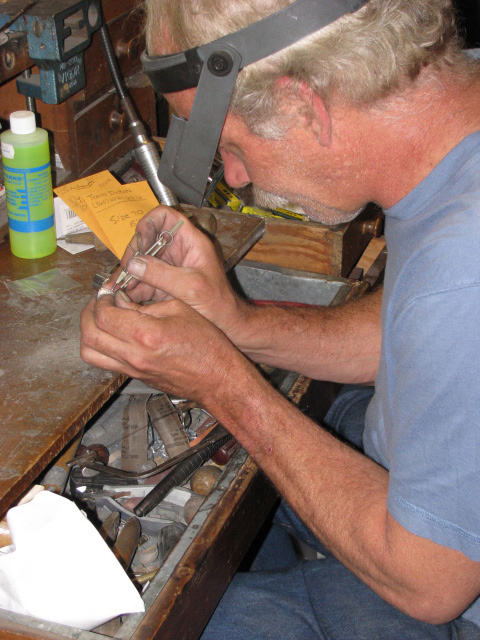 Dan especially loves forging and fabrication by hand, and believes that jewelry should be made in this manner, if possible, as it produces a superior product. All of our jewelry is handmade by Dan, and the majority of our pieces are hand forged. We alloy all of our metal and we hand-mill all of our stock. We purchase most of our precious metals from a local refinery that deals entirely in recycled metals. We purchase our gems only from suppliers that pledge to sell conflict-free stones. Our business philosophy is simple: provide an excellent product with personal attention at a reasonable price. We hope that we will be able to provide you with jewelry that will be treasured for generations. Thank you for visiting our shop. Wonderful craftsmanship, we love the ring we ordered! The quality of work is off the charts. Ravens Refuge has been amazing through the through the whole process, from consulting and helping us select a ring size to receiving it in the mail. Thank you!